On 11 Oct 1859 in Star Inn, Stirling Elizabeth married John Rogerson son of James Rogerson and Mary Johnston, born on 20 Apr 1821 in Johnston, Dumfrieshire. John was a merchant with Alexander Paton & Co., soft goods merchants, the company Elizabeth's little brother Ebenezer was later to be apprenticed to as a clerk. Sadly, on 30th January 1860, after only three months of marriage, Elizabeth died of jaundice. She was living at the time at 101 St. Georges Road, Glasgow, and was buried in the Glasgow Necropolis on 2nd February. 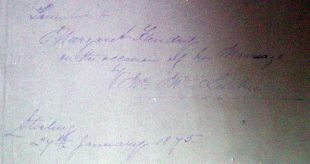 A few years after the death of Elizabeth John remarried. His second wife was an Agnes Anderson with whom he had four children. John died on 17 Apr 1879 in Ashfield House, Bothwell, Lanarkshire For further details of John Rogerson, his ancestry and his life after the death of Elizabeth - See Appendix C.
Ebenezer died on 16 Aug 1841 in Stirling and was buried in the graveyard of Stirling Church of the Holy Rude alongside his siblings, Robert and John who also died in infancy. The tombstone has fallen over and is lying face down. Robert died on 15 May 1845 in Stirling and was buried in the graveyard of Stirling Church of the Holy Rude, alongside his siblings, Ebenezer and John who also died in infancy. The tombstone has fallen over and is lying face down. Ebenezer born 21 Aug 1844, Stirling. Ebenezer married Agnes Williamson on 17 Dec 1867 in Helensburgh. Ebenezer died on 2 Apr 1914 in Dumfries. Agnes died on 11 Oct 1891 in Stirling. Next Generation of our family History - For further details see main text. John died on 18 Jun 1848 in Stirling and was buried in the graveyard of Stirling Church of the Holy Rude, alongside his siblings, Robert and Ebenezer who also died in infancy. . The tombstone has fallen over and is lying face down. It would seem that Alexander became a clerk in the drapery business, perhaps with the same company as his older brother, Alexander Paton & Co. There is a n 1871 census record of what is almost certainly "our" Alexander lodging at 1 Anigua Place in Glasgow and recorded with the occupation "drapery clerk". Margaret born 4 Feb 1852, Stirling. On 27 Jan 1875 in Glasgow, Margaret married Charles Hercules Reynolds, a naval architect \ ship building manager. Margaret was recorded as aged 22, resident at 54 Murray Place, Stirling, the daughter of Ebenezer Hendry, an innkeeper (deceased), and Isabella Thomson. Charles was recorded as an engineer, aged 28, resident at 6 Radnor Terrace, Sandyford, Glasgow, the son of Charles H. Reynolds, a hotel keeper, and Charlotte Hands. The witnesses were John F. Miller and John Rogerson. (See Note on Charles and Charlotte other family and ancestry below). At the time of their marriage Charles and Margaret were presented with family bible by Mr McLuckie of Stirling. This bible is still in the family as sadly Charles and Margaret never had any children. (As far as I am aware). For the census of 1881 Margaret was living with her husband at 9 Broomhill Terrace, Govan, Glasgow. From the Glasgow Post Office directories from this time it would appear that Charles was employed at the ship building firm of D & W Henderson's and at the Meadowside Works in Partick. His address at the start of the 80's is also listed Cupraim House, Broomhill Terrace, Partick. 9 Broomhill Terrace, Govan, Glasgow. It would seem that circa 1888 Charles left the employ of D & W Hendersons as he is long longer listed in the Glasgow Post Office directory after the 1888-89 edition. It would seem he and Margaret had moved south of the border, to Tyneside, as for the census of 1891 he and Margaret was living at Long Benton, on the outskirts of Newcastle on Tyne. Charles is still working as a Naval architect, I suspect for the Walker Shipyard of Sir W. G. Armstrong, Mitchell & Co. As mentioned the couple seem not to have had any children but have Charles's elderly father was also recorded in the household. Margaret has her niece Isabella Hendry visiting from Stirling and there is a second visitor from Scotland an Ella Boston. Ella would seem to have been born in Bonhall, Dumbarton, the daughter of Thomas Boston, a tea merchant, and his wife Margaret. Certainly for by 1893 Charles was working at the the Walker Shipyard as the as in the April 1893 edition of the "The Marine Engineer - A Monthly Journal of Marine Engineering, Shipbuilding, Steam Navigation & Electrical Engineering", his name was included amongst the company present on Saturday, 18th March at the launch of the James Brand, built at the Walkers yard viz Charles H Reynolds, Manager. James Brand.— On Saturday, March 18th, there was launched from the Walker Shipyard of Sir W. G. Armstrong, Mitchell & Co., a large steel screw steamer, built to the order of Mr. Alfred Suart, of London, and intended for the carriage of petroleum in bulk. The vessel has been constructed on Swan's patent system, and to the highest classification of Lloyd's Registry. Her principal dimensions are :— Length, 352 ft. ; breadth, 44 ft. ; depth, moulded, 31 ft. She is capable of carrying over 5,000 tons deadweight on a moderate draught of water. For dealing with her cargo, she will have a complete pumping and piping installation. Her deck machinery is all supplied by Messrs. Clarke, Chapman, A Co., which firm will also fit the electric light installation throughout the vessel. The vessel was named the James Brand by Mrs. Tomlinson. After the launch, the vessel was taken to the works of the Wallsend Slipway and Engineering Co., where she will be fitted with triple-expansion machinery, embracing all the latest improvements. Amongst the company at the launch were Mr. Fowler, Mr. Denny, Mr. Eldridge, under whose supervision the vessel has been constructed; Captain Masters; Mr. Eeles, the owner's consulting engineer; Mr. H. F. Swan, director; Mr. Charles H. Reynolds, manager ; Mr. and Mrs. E. L. Orde, Ac. No trace can be found of Margaret or Charles H. in the 1901 census, however for the 1911 census Margaret and Charles, now retired, were living in Hampstead, London. The address and the presence of two maids suggest a comfortable lifestyle! The greater part of the inscription is illegible so reconstruction is best guess from known dates of death etc. Charles Hercules Reynolds died on 11 November 1920 at 97 Alexandra Road, South Hampstead, Middlesex. His estate was valued at £2295 16 shillings and 4 pence. Margaret only outlived her husband by a few years, dying on 20 March 1923 at the same address. The executor was named and Elizabeth Hendry or Anderson, wife of Andrew Anderson, her niece who was resident in Croydon at the time. Both Charles and Margaret were commemorated on the stone erected in memory of Charles's grand-mother Mary Hands in Stirling Cemetery, Stirling. However according to the cemetery records only Margaret was actually interred within the plot it marks. The stone is not too far from the main Hendry stone. Charles Hercules Reynolds was born in Oct 1846 in Lambeth, London (Lambeth 4 359). . Charles married Margaret Hendry daughter of Ebenezer Hendry and Isabella Thomson on 27 Jan 1875 in Glasgow. Margaret was born on 4 Feb 1852 in Stirling. Charles died on 11 Nov 1920 in 97 Alexandra Road, South Hampstead, Middlesex. Margaret died on 20 Mar 1923 in 97 Alexandra Road, South Hampstead, Middlesex. They had no children. Thomas Reynolds was born about 1848 in Birmingham, Warwickshire. Nothing else currently known. Charlotte Reynolds was born about 1850 in Birmingham, Warwickshire. Unmarried with her Uncle Thomas Ash and her Aunt Harriet Ash, nee Hands for the 1881 census at Rockville, Sutton Road, Aston, Warwickshire. Nothing else currently known. Arthur Reynolds was born about 1855 in Birmingham, Warwickshire. Nothing else currently known. Minnie Reynolds was born about 1857 in Birmingham, Warwickshire. Nothing else currently known. Emily Reynolds was born about 1859 in Birmingham, Warwickshire. Nothing else currently known. Harriet Reynolds was born 25 Oct 1862 Central District, Glasgow, Lanarkshire. Nothing else currently known. For the census of 1851 Charles would seem to have been the licensee of the Duke of York pub, in York Road, Lambeth. Included in the household was his son Charles and what I assume was his sister in law Fanny Hands (born on 24 Feb 1824 in Birmingham). Charles's wife, Charlotte, and their children, Thomas and baby Charlotte, were staying with his wife's sister Harriet (born on 15 Dec 1819 in Birmingham) and Harriet's husband Thomas Ash, at Murray Place, Stirling. Thomas and Harriet were married in Birmingham in 1846 (Ref: Oct-Dec 1846 Ref West. Bromwich Vol 18 Page 767). Also recorded in the household was Mary Hands, Charlotte's mother. Charlotte's mother, Mary Hands nee Ward, died on 28 Jan 1860 aged 65 at Cairnpark Street, Dollar. She was recorded as a widow, the daughter of James Ward and Elizabeth Hopkins. A stone in her honour was raised over 2 lairs (28 & 29) in Section U in the Mar Cemetery in Stirling which were purchased by her son in law Thomas Ash in 1860. There is no record of her interment in either of these lairs but it seems quite a co-incidence that the lairs were purchased by Thomas the year of his mother in laws death? Charles, Charlotte and their family have not yet been identified in the 1861 census but in that year there is an advertisement in the "Cook's Scottish Tourist - Official Guide" by Thomas Cook for the Reynolds's Hotel at 9 Dundas Place, in Glasgow. 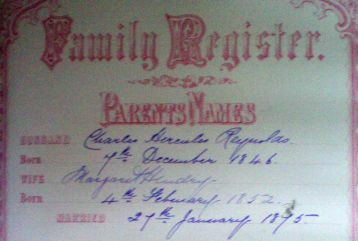 There are subsequent Glasgow Post Office directory entries for Charles at 9 Dundas Street going forward from 1861-62, and it was in Glasgow that Charles and Charlotte's youngest daughter, Harriet, was born 25 Oct 1862. It was at the Dundas Street address that they were recorded for the census of 1871. It would seem that shortly after the 1871 census Charles retired from the hotel in Glasgow. This is extrapolated from the Glasgow Post Office Directories which show Charles at the Hotel from 1862\63 until 1871\72. For the 1881 census Charles his wife and their younger daughter were recorded at Wellington Road, Edgbaston, Warwickshire. Whether Charles and Charlotte had moved back to the West Midlands is unclear. However sadly the next record we have of the couple is that of the death of Charlotte on 9 Aug 1887 in Scotstounhill, Renfrew, Renfrewshire. It would seem that either Charles himself or possibly his son Charles Hercules jnr. purchased the lair in Mar Cemetery, Stirling, owned by his brother in law Thomas Ash, in this year (1887), and this is where Charlotte was laid to rest, possibly along side her mother Mary Hands. Charles was also laid to rest in the Mar Cemetery grave alongside Charlotte. Both he and Charlotte were commemorated on the stone which as has been already stated is not too far from the main Hendry family grave. Charles Hands was born about 1795 in England. Charles married Mary Ward daughter of James Ward and Elisabethg Hopkins on 6 Mar 1816 in Saint Martin, Birmingham, Warwick. Mary was born about 1795 in England. William Hands christened on 28 Jul 1817 in Cherington, Warwickshire. Charlotte Hands born on 7 Aug 1818 and christened on 26 Aug 1818 in Saint Phillips, Birmingham, Warwick. Charlotte married Charles Hercules Reynolds son of William Reynolds and Elizabeth ??????? Jan-Mar 1846 in Lambeth, London (Ref: Lambeth Vol 4 Page 39). Charles was born on 29 Apr 1812 and christened on 6 May 1813 in Saint Phillips, Birmingham, Warwick. Charlotte died on 9 Aug 1887 in Scotstounhill, Renfrew. 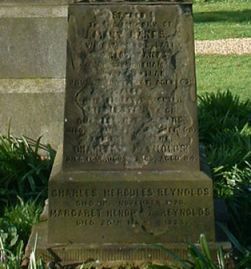 Charles Reynolds died on 16 Aug 1895 in Tynemouth (Tynemouth 10b 155). Harriet Hands born on 15 Dec 1819 and christened on 5 Jan 1820 in St Phillips, Birmingham, Warwickshire. Harriet married Thomas Ash in Oct-Dec 1846 in West Bromwich (Ref: West Bromwich Vol 18 Page 767). Thomas was born about 1823 in England. Caroline Hands born on 14 Oct 1821 and christened on 24 Dec 1821 in St Phillips, Birmingham, Warwickshire. Frances Hands born on 24 Feb 1824 and christened on 20 Mar 1824 in St Phillips, Birmingham, Warwickshire. Frances married Richard Morris Randles Jul-Sept 1851 in Birminghan (Ref: Aston Vol 16 Page 316). Richard was baptised 5 Jan 1806 in Maker, Cornwall, the son of Richard and Mary Ann Randles. Richard died on 14 April 1868 in Motherwell and was commemorated on the Hands stone in Mar Cemetry, Stirling. It is currently unknown when Frances passed away. Jane Hands born on 27 Feb 1825 and christened on 24 Mar 1825 in St Phillips, Birmingham, Warwickshire. Esther Hands born on 27 Feb 1827 and christened on 19 Mar 1827 in St Phillips, Birmingham, Warwickshire. Charles Hands born on 2 Sep 1828 in Birmingham, Warwickshire. He was christened on 29 Sep 1828 in St Phillips, Birmingham, Warwickshire. Stephen Hands born on 12 Jun 1830 in Birmingham, Warwickshire. He was christened on 6 Jul 1830 in St Phillips, Birmingham, Warwickshire. Charles probably died between 1841/1851. Mary died on 28 Jan 1860 in Cairnpark Street, Dollar, Clackmannanshire. She was buried in New Cemetry, Stirling.